It's common knowledge movie studios these days rip figures and stories for their blockbusters not from the headlines, but from the world of comic books: The Amazing Spider-Man, Iron Man, X-Men, Thor, The Avengers, The Hulk, and The Dark Knight Rises are just some of the results. Morality and justice have a place in these worlds. The straightforward plot of good guy defeats bad guy is not only quality escapism, it also addresses contemporary fears of looming threats. 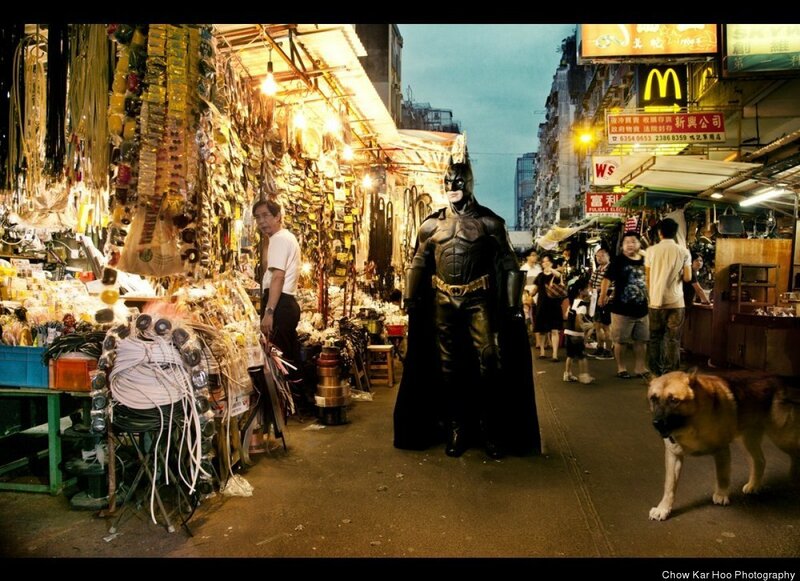 Two photographers in Hong Kong turned this fantasy on its head, by showing superheroes having not so super lives. "Heroes Next Door," a series by Chow Kar Hoo and Chris Lam, documents the good guys we know and love in the most mundane of situations, whether it's Wolverine slicing meat at the butcher shop, or Kamen Rider assessing his ticket for parking his bike in a tow-zone. The exhibit just wrapped up a monthlong run at Hong Kong's Shin Hwa Gallery. Check out a selection of the photos below, and head to Chow's site for more. Chow Kar Hoo, 'Heroes Next Door,' Hong Kong.